The Tantalizing Tigirl in her first big adventure. The lone survivor of a doomed alien planet of cat people, Tigirl was sent to Earth as an infant, and raised by Amazons in the rain forest. She later realizes she has powers and abilities far beyond those of other jungle girls, and is found by an explorer and her grandson. Tigirl falls for the young lad, and tries to beome a superhero to impress him. But the evil catgirl, Cleocatra, emerges to challenge Tigirl. Exciting feline action in this new tale Story by Sean Taylor. Art by Willie Jimenez. Original concept by Jer Alford. This is available through us and at Lulu, you can download this at Drive Thru Comics. 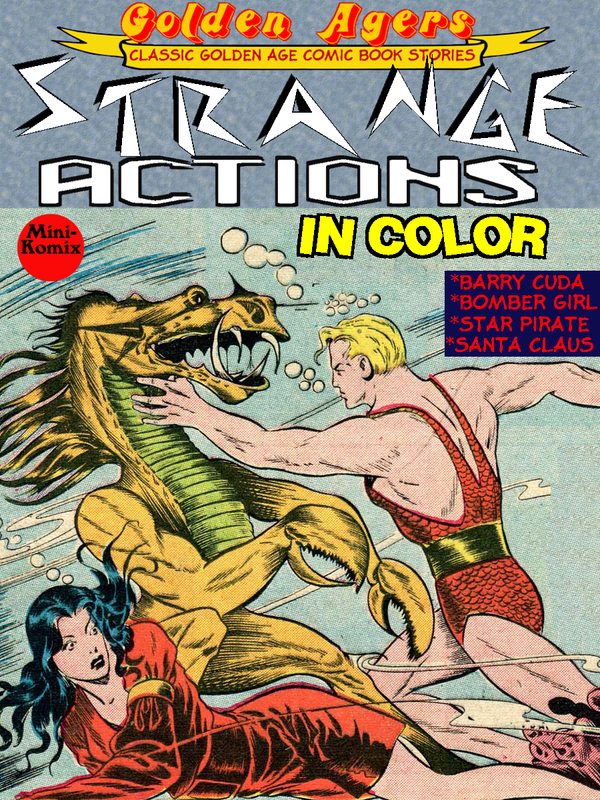 Golden Agers takes some seriously Strange Actions! Opening is the catwoman hybrid Felicia, Barry Cuda rescues Queen Merma from fishmen, Golden Knight slays a dragon, Tegra Jungle Empress fights the Soldiers from Saturn, Auro Lord of Jupiter stops space slavers, Blonde Bomber goes back in time, Star Pirate searches for a missing gem, The Wizard gives a dam, and Santa Claus duels with Dracula! Sci-fi and supernatural smashups of stupendousness! 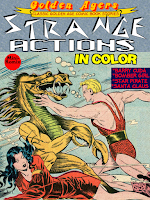 You can download this color comic now at Lulu.com and Drive Thru Comics, as well as part of the Golden Agers: Strange Series Bundle. 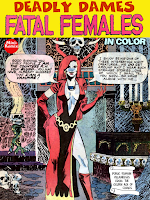 Deadly Dames creeps back into your heart with these Fatal Females! Learn the origin of the female vampire Countess Von Bludd, Mike Strong investigates the siren of Suite #13, The Witness drives a man to confess his sins, Sonia swings the Dance Of Death, Buzz Ryan is entranced by a voodoo queen,charming Chita helps out outlaw Frank Stilwell, the snakewoman Zelda assists a magician with his demonic act, pirate queen Nourma plots to temp the Black Roger, the Falhawk Queen terrorizes Tabu, a sinful siren ensnares The Hawk, and the Queen of Evil rises from ancient Egypt to plague the modern world! 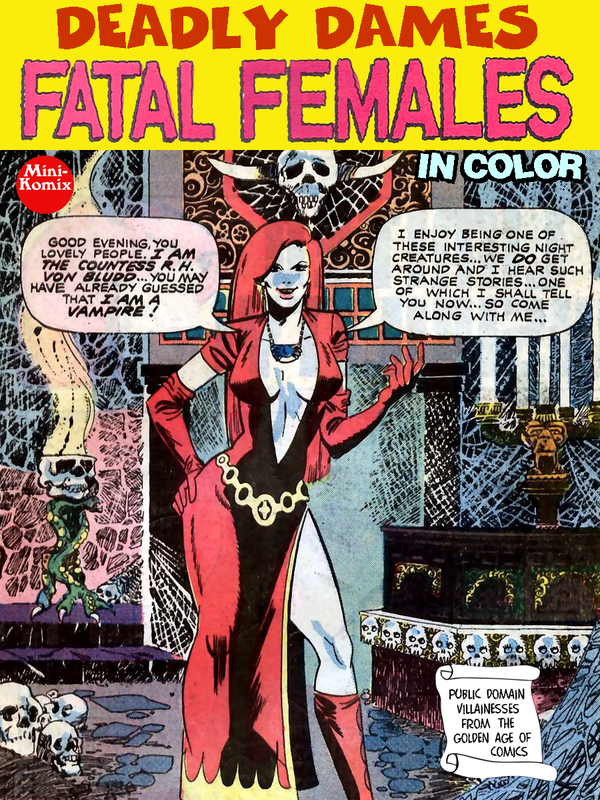 Public domain villainesses from the Golden Age of Comics, and in color! You can download this now from Lulu and Drive Thru Comics, as well as part of the Deadly Dames Bundle. Sass Parilla is back with a new paperback graphic novel. This reprints the original Sass Parilla Pulp Adventures comic written by Chuck Porterfield with art by Jason Bullock and Blake Myers. It also features Sass Parilla comic strips written by Jer Alford and drawn by Ashley Rowland, plus a sketch gallery. Based on the original award-winning 4-part movie serial, The Adventures Of Sass Parilla The Singing Gorilla. 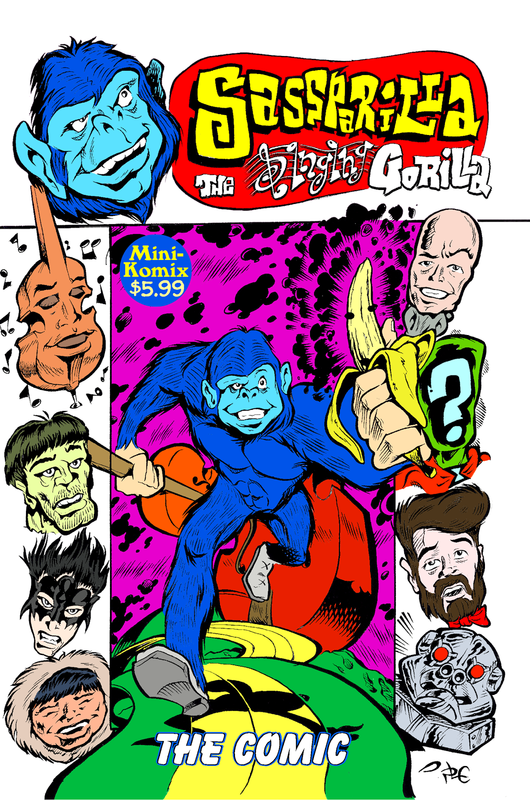 This is available through us and at Lulu, in digital format at Drive Thru Comics, and both at Indy Planet. 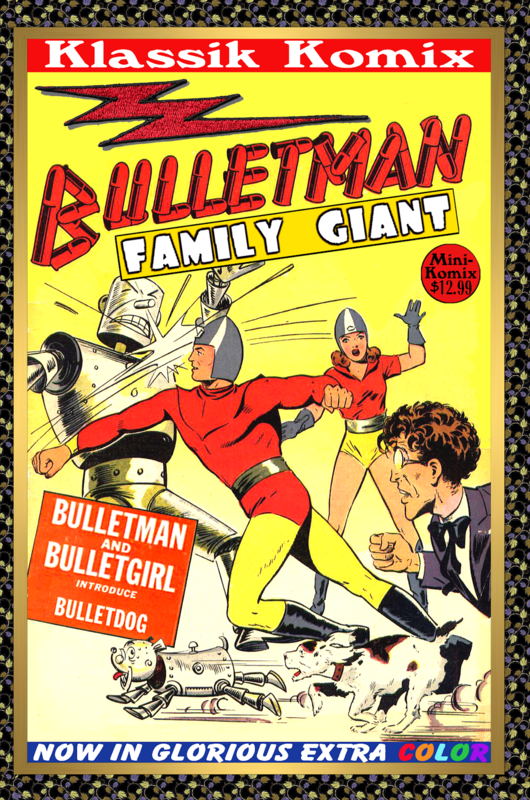 Klassik Komix blasts to the past with the Bulletman Family Giant(in color). Jim Barr is a mild-mannered police scientist who develops a special helmet that allows him to become the flying detective, Bulletman! Along with his partners Bulletgirl and Bulletdog(the original super-pet! ), the Bulletman Family battles the strangest villains of all time! 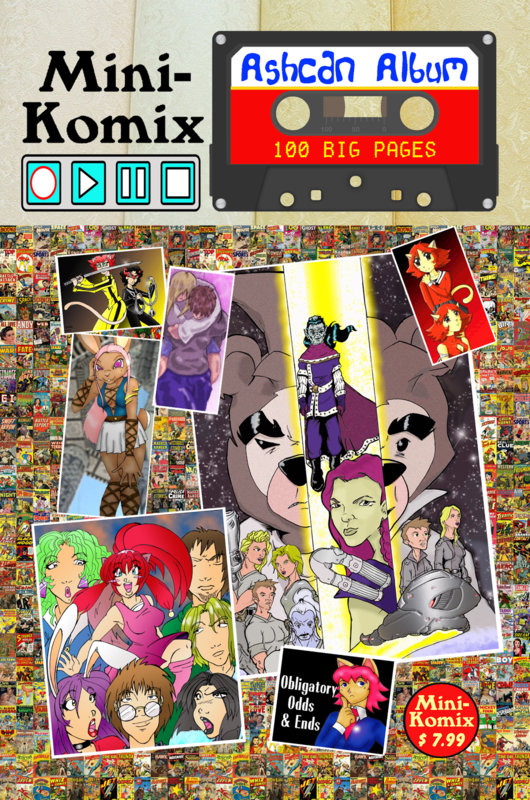 100 Big Pages, IN COLOR! Now available in print at Lulu.com. Mini-Komix keeps putting out the hits with this traditional Ashcan Album! Some of our regular characters in new stories, as well as fresh material! This features two stories of T.E.D. (Time Exploration Droid), plus High School Sweethearts, Kitty Honey, Gaijin Hi, and Sushi Breakfast from Senshi Vs. Sentai. All this and Seasons Greetings From Hell! Hip hits from the indy comics crowd! You order this in print through us, and from Lulu.com.